Freak's paradise !!! : of Daal, Chawal and some pappadams !!! 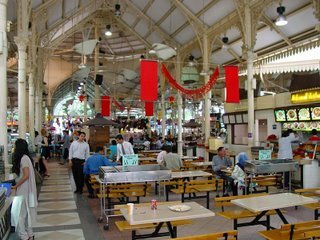 Having had food at almost all the joints in Lau Pa Sat... Me and Badz were finding it suicidal to go there again. The auspicious Diwali day gave us the chance of our life to find a chef in us... the first hurdle was to start the kitchen.... although we had brought with us all the needful utensils and necessary items a week back... but needed a spark to start the burner !!! Yesterday we(read Badri) tried our hands at Khichdi... which also came out nice !!! and like our bosses put it... both of us have a greaat future ahead... !!! What did you say you wanna eat ??? Malai Kofta and Kashmiri Pulao.... here you go !! !